I’m doing this August update from the Great Smoky Mountains as I took off Thursday and Friday to spend some quality time with the family before my youngest heads off to Virginia Tech. We left late on Wednesday and the nighttime drive through the Smokies rewarded us with an uncrowded drive and also an abundance of wildlife. 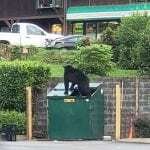 We passed three “critters” that all of us first thought were small bear on the side of the road. We actually turned around and drive back to witness three wild boar or feral hogs. They scurried into the forest as our light hit them. 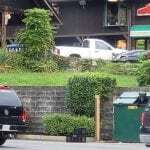 We arrived in beautiful, downtown Gatlinburg moments later and as we pulled into our lodging at the Brookside Resort motel we said a sizable crowd gathered. 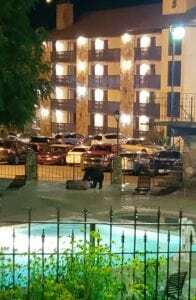 Turns out it was a 500-600 lb black bear! We kept our distance but watch the big fella lazily rolling around, evidently willing to entertain us (and not eat us) since he’d already filled his tummy with leftover pancakes, honey, syrup and pizzas from Flapjack’s and Papa Johns across the street. Click to enlarge this shot taken at poolside. Okay, I guess his belly wasn’t full. 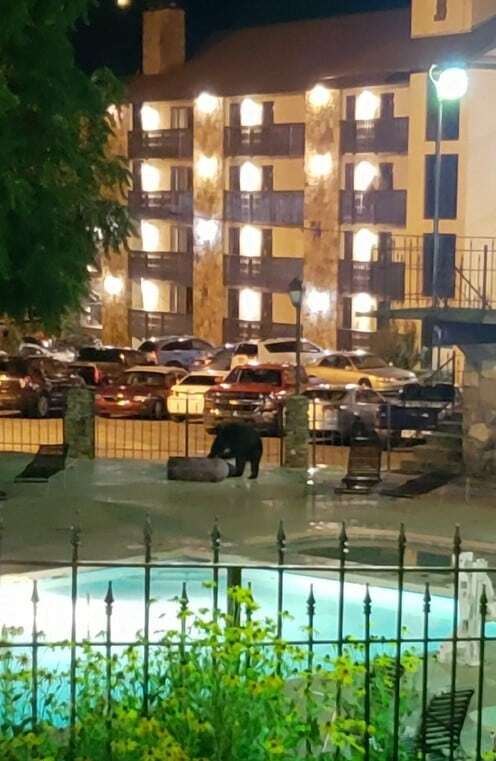 Not sure WHY they temporarily closed the pool to other guests. Click to enlarge this shot My favorite of the photos! 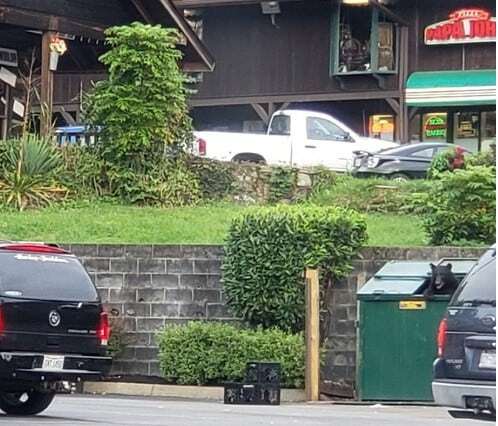 How would have liked to have been a guy trying to dump some trash around that same time? Click to enlarge this shot. Great photo as well. 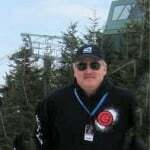 I know how everyone loves bears…so I figured I’d share them even if they don’t have anything to do with a ski and snowboarding website! 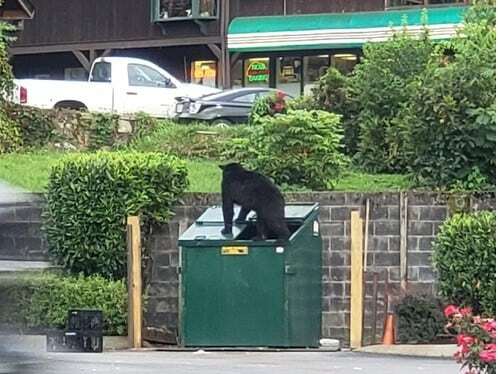 Come to think of it, Sugar Mountain’s mascot is a Sugarbear. 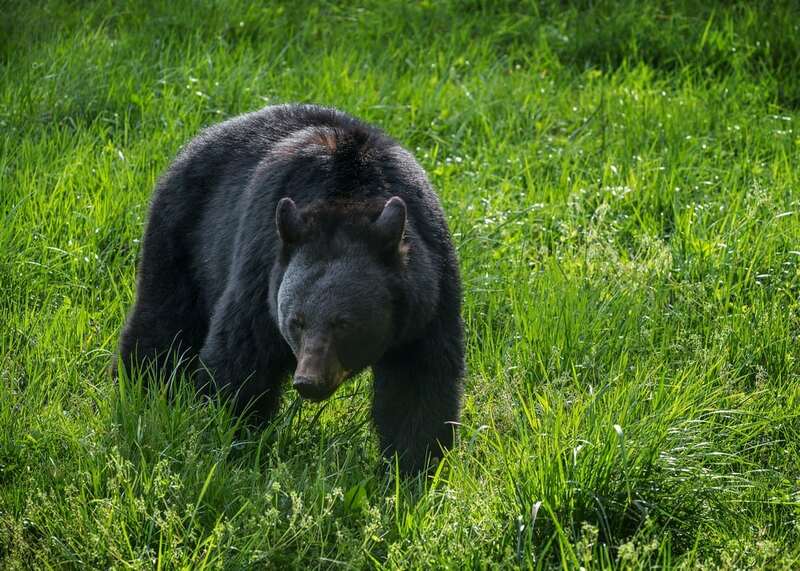 By the way, the lady at the front desk advised us to keep our eyes and ears open as evidently this is the end of mating season for the black bear population. So I guess love is in the air…enjoy. 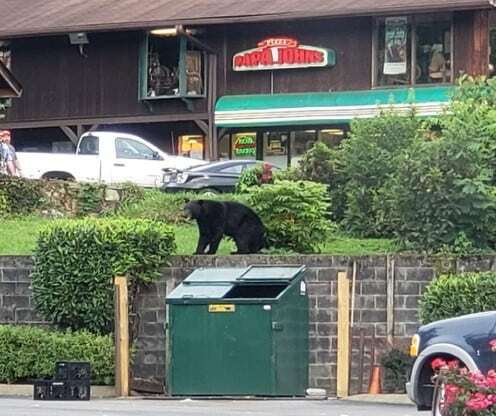 ****The black bear image at the top of this story was taken by Anthony Heflin just outside of Gatlinburg. The other photos were taken by an android and not large enough to feature on the front page. Thanks to the nice lady at the hotel for sharing them.